California, which imports over 25% of its electricity from out of state, is in no position to lose half (!) of its entire nuclear power capacity. But that’s exactly what happened earlier this year, when the San Onofre plant in north San Diego County unexpectedly went offline. The loss only worsens the broad energy deficit that has made California the most dependent state in the country on expensive, out-of-state power. Its two nuclear plants — San Onofre in the south and Diablo Canyon on the central coast — together have provided more than 15% of the electricity supply that California generates for itself, before imports. But now there is the prospect that San Onofre will never reopen. Will California now find that it must import as much as 30% of its power? The problem of California’s energy dependency has been decades in the making. And it’s not just its electrical power balance that presents an ongoing challenge. California’s oil production peaked in 1985. And despite ongoing gains in energy efficiency via admirably wise regulation, the state’s population and aggregate energy consumption has completely overrun supply. Some will say, however, that California doesn’t need to concern itself with domestic energy production. As an innovation economy, in the manner of Japan or South Korea, many have said California can simply import greater and greater quantities of energy in exchange for its intellectual capital and the services and products it provides to the world. But the problem with such a notion is that it extrapolates the trend too far. Only a century ago, California was an emerging giant of oil and gas production, building much of its wealth from natural resource extraction. It was inevitable that this would change over time. However, given the state’s high priced electricity, its wrongly devised transportation system (which is heavily exposed to oil prices), and its deep financial distress, the nation’s largest economy is having to exchange greater amounts of capital to keep itself running. 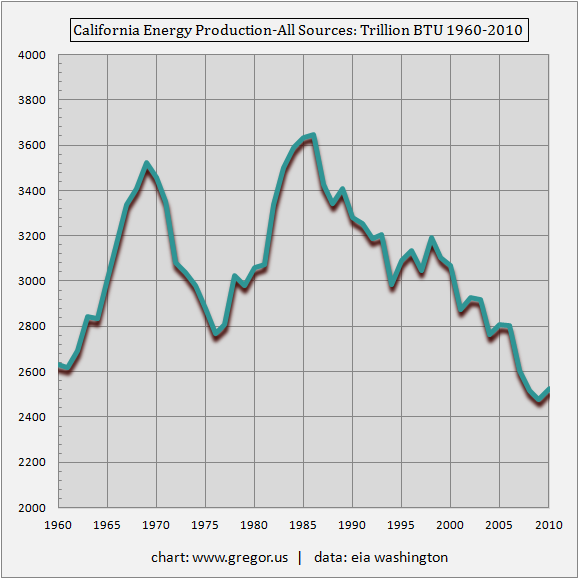 Since 1985 (the year that state oil production peaked above one million barrels a day), the state of California has seen its portfolio of energy production steadily decline, from an all- time high above 3,600 trillion BTU (British Thermal Units) to 2,500 trillion BTU (latest available data is through 2010). Because the contribution from both nuclear and renewables during that period has been either small or simply flat, the steady decay of California’s oil and natural gas production has sent the state’s energy production to 50-year lows. However, during those five decades from 1960 to 2010, California’s population more than doubled, from nearly 16 million to nearly 38 million people. Additionally, California built out its freeway system and expanded greatly into counties such as Riverside and San Bernardino. Indeed, in San Bernardino County, population quadrupled from 1960 to 2010, from five hundred thousand to over two million, with the attendant homes, public infrastructure, state highways, and freeways. This great expansion of California’s residential and industrial topography was a tremendous value proposition back when energy, especially oil, was cheap. But now we are in a new pricing era for oil. Equally, California must also pay some of the highest electricity rates in the country. In counterpoint to the dreams of energy conservation, while California’s population merely doubled, its electricity demand rose nearly fivefold, from 57 million KWh in 1960 to 258 million KWh in 2010. Essentially, California, like the rest of the country, has built a very expensive system of transport, which is now aging along with its powergrid. Surely in the forty years that followed 1960, the prospect that California would have to import greater quantities of fossil fuels and electricity was no cause for alarm. However, the capital that is now required each year to maintain its aging highway system and purchase out-of-state oil and electricity, is mounting. While it’s true that California’s GDP is mighty and ranks as the 8th largest in the world, it’s also true that even smaller US states have seen their energy production not fall, but rather advance, in the era of higher-priced energy. Surprisingly, California’s total energy production is now lower than Pennsylvania’s, which is an intriguing contrast given that the Keystone State figures so prominently in the history of early oil and coal production. Who will produce all the energy that California will need to buy in the future? In the wake of the Fukushima disaster, a number of countries and communities are reassessing the risk and the cost of nuclear power. Overall, however, it is the aggregate complexity of nuclear power that is driving the global stagnation and now the decline of this particular source of energy. California energy officials are beginning to plan for the possibility of a long-range future without the San Onofre nuclear power plant. The plant’s unexpected, nearly five-month outage has had officials scrambling to replace its power this summer and has become a wild card in already complicated discussions about the state’s energy future. That long-range planning process already involves dealing with the possible repercussions of climate change, a mandate to boost the state’s use of renewable sources to 33% of the energy supply by 2020 and another mandate to phase out a process known as once-through cooling, which uses ocean water to cool coastal power plants, that will probably take some other plants out of service. “Some of the weaknesses we have in the infrastructure [of Southern California] are laid bare by San Onofre,” said Steve Berberich, chief executive of the California Independent System Operator, the nonprofit that oversees most of the state’s energy grid… Before the current shutdown at the plant, officials had planned only for a scenario in which one of the reactors would be off line. No one had anticipated a complete shutdown. The plant’s 2,200 megawatts of power provide electricity to about 1.4 million homes, but the facility also provides voltage support to the transmission system that allows power to be imported from elsewhere to the region San Onofre serves, particularly San Diego. San Onofre’s processing ability has been damaged by faulty computer modeling, which caused excessive and accelerated wear in its steam generator tubes. The cost and timeframe for a solution may be so great that the return on such an investment may not be worth it. But again, note the complexity involved here, which runs the spectrum from computer programming that guides the reactors’ operation to the critical role that this southern California power source plays in the grid. In powergrids, nuclear power plants play an infrastructural role but are also critically dependent on receiving power from elsewhere in the grid. As Japan discovered, its own power plant structurally survived the tsunami but failed when it lost external power. In 2010, the year for which the latest data is available, California consumed 258,531 million KWh (kilowatt hours). 26% of that total was imported mostly from other US states (54,406 million KWh) and a small amount came from Mexico. California’s two nuclear plants provided 32,200 million KWh, about 12% of the total power that the state consumes from all sources. Roughly speaking (because supply, demand, and capacity fluctuate from year to year), the loss of San Onofre will increase California’s potential dependency on out of state power by at least another 5%. This will indeed push out-of-state power dependency to 30%. California, like Texas, has been a giant in the history of US oil production. But after reaching a peak rate of production in 1985-86 at around 1.1 million barrels per day, California now produces half that amount, at 540 thousand barrels per day. Just as in other post-peak producing regions of the world, such as Mexico and the North Sea, there is a constant flow of hope and theorizing that once again California could increase its oil production. While it’s true that opening offshore blocks to development could eventually stabilize and possibly raise the state’s aggregate production, it is highly unlikely that onshore production can now be moved higher. The reason is that best technology practices are already well-deployed in California’s onshore production — where old, original fields continue to produce, but at much lower rates. More important is that California now has over 35 million registered vehicles, nearly matching its population. That makes California automobile rich but public-transit poor, as the state remains highly leveraged to gasoline. Indeed, the post-war buildout of California followed the low-density, urban-sprawl model that was replicated throughout the nation after 1950. Accordingly, cities like Los Angeles are having to make a Herculean effort to resurrect a light rail system (built on the grid of its historic trolley network, once the largest in the world). But 60 years of automobile-driven development will not be undone easily. The state is already spending a disproportionate amount of capital each year just to maintain the existing highway system (an issue we will explore in Part II of this article). And despite that ongoing investment, Californians drive on roads with some of the poorest conditions in the country. 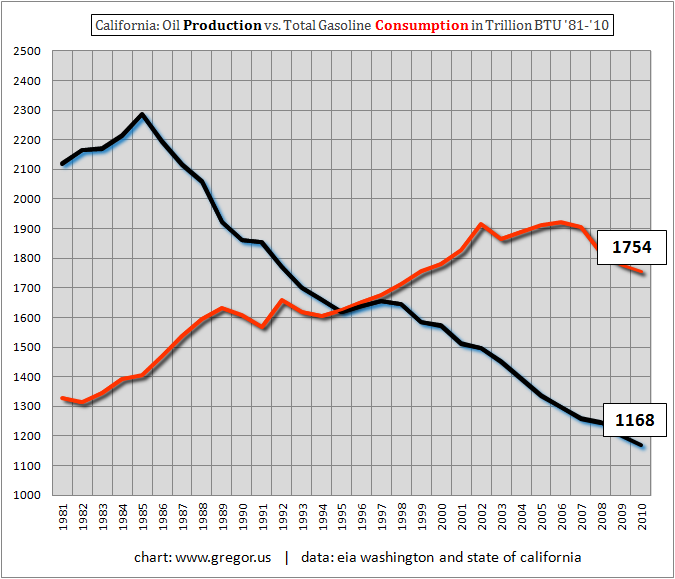 The spread between the quantity of oil produced in California and the quantity of gasoline consumed started to blow out in the mid 1980s, when gasoline consumption rose above oil production as measured in BTUs. Many believed this to be sustainable. But as the rest of the country would discover, a price revolution in oil would eventually hurt the economy very badly — and, consequently, oil consumption. In BTU terms, the difference between production of oil and consumption of gasoline reached its widest in 2006-2007, when annual consumption was running above 1,900 trillion BTUs and oil production at 1,250 trillion BTUs. Now consumption, like production, is falling. Will consumption follow production downward, relentlessly? The prospect that petrol consumption has peaked in California, along with the rest of the United States, is exciting if one is viewing such a transition through the lens of efficiency, sustainability, and post-industrialism. However, the dream of a non-industrial economy, like all good ideas, reaches a terminus when we consider that a majority of human services and products are still delivered and produced through physical processes. The State of California does not deliver state transportation, health care, education, police and fire protection, and public works digitally through the Internet. Instead, energy, delivered through tangible infrastructure, is required to run the Golden State. In Part II: California: The Bellwether for the Rest of America, we take a look at the severely-pressured state budget of California, as well as other measurements of its economy indicating that the direction of its energy balance is entering dire territory. What exactly is the cost of California’s energy consumption? And what does it mean, as companies like Facebook build data centers outside the country to access external sources of electricity, that California cities such as Stockton declare bankruptcy? There is no miracle solution for California. Even if we assume that the country continues to enjoy cheap natural gas prices, the cost of imported electricity from NG-fired power generation will not fall, because the cost of electricity transmission will continue to rise as the grid ages and requires new investment. Eventually the price level of higher energy and lower quality public services will also catch up even to higher wage employees, because a hollowing-out effect is going to pare down the number of service providers — teachers, merchants, construction workers, and even health care professionals and lawyers. Such woes, however, are not unique in any way to California. They are shared by most US states right now; California is simply further down the timeline at this point. The key question here is what are the steps Californians (and the rest of us) should be taking?